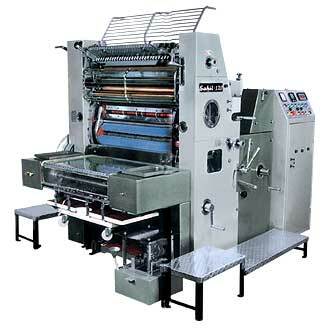 Sahil Swing Gripper Model Machine is designed with modern tech and advanced concepts provide strong technical support for commercial printing operations today. The automatic operations in many parts of the press reduce make-ready but greatly ensure printing quality. The press has a wide range of application, easy and comfortable operation, ideal for better economic benefits and winning an edge in the competition for modern commercial printers. This press meeting the needs of various printing jobs with its excellent mechanical structures can complete high quality printing. Other specially designed features & functions epitomize its excellent printing with different materials. Swing Gripper mechanism ensure dot to dot registration of even thin stocks at all speeds. The operator can do the make ready operation at low speed and the registration will hold good even when the press is running at high speed. Moreover, Swing Gripper also gives extra time for proper registration. If any sheet is mis-fed even for an inch it reaches the front lay and its proper feeding is ensured. Swing Gripper mechanism to have a high production capacity. Bearing side lay to get Perfect & Accurate registration. Precision ground & hard chrome plated cylinders. Machine Sizes : 16"X21", 18"X25", 18"X28", 20"X30", 22"X32" & 24"X37"
Sizes 16"X21" 18"X25" 18"X28" 20"X30" 22"X32" 24"X37"
Running speed 2000-8000 I.P.H. 2000 -8000 I.P.H. 2000-8000 I.P.H. 2000-8000 I.P.H. 2000-8000 I.P.H. 2000-8000 I.P.H. Note : Printing speed depends upon kind, condition and thickness of stock, type of inks used, desired printing quality and other operating conditions. Illustration/Specification are not binding and are subject to change without notice due to our continuous R & D effort for Improvements / Modifications.